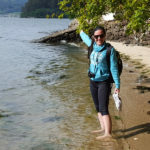 We all want to make the Camino de Santiago journey as comfortable as possible and a few basic do’s and don’ts are not really enough to make it easier on your body and especially your feet. They take a pounding on most ordinary days but what you’re about to put them through means they need to be prepared and you can’t ignore them when they grumble! Preparation starts with your footwear, they need to be breathable so moisture isn’t trapped, sturdy to protect the feet from injury and a good fit. Don’t go out in new boots or shoes, break them in well beforehand, checking seams for rubbing, dry soap rubbed on the inside of the seam to soften it can help, and the heels for slipping. Bear in mind the feet will swell in warm conditions. Socks are an area where a lot of opinions differ, I find clean dry soft hiking socks are a sound investment (not cotton as they retain moisture). The seamless ones are best. Don’t expect one pair to last you all day in the heat, carry a few pairs with you and change them regularly to keep the feet dry. Some advise to wear 2 pairs of thin socks so the friction is reduced, this is good advice. Using a polypropylene inner sleeve and a wooden outer sock has been proven effective. Skin preparation has people divided, advice ranges from moisturising well in the weeks before, using a solution like Surgical Spirit to harden the feet, painting on solutions like Tincture of Benzoin daily for a couple of weeks beforehand to build a protective layer, even using talcum powder. The talc idea makes me shudder because once the foot starts to sweat it becomes a sticky mess which actually increases friction, it might work at home but in 30 * of heat it’s the stuff of nightmares! Keep the feet dry at all times, stop and change your socks when your feet tell you, not a mile down the road at the next rest stop. By then the damage is done. Treat any fungal skin infections before you go or the heat and sweat will make your toes feel like a 4th of July firecracker has been taped to it….and let off! Conditioning is paramount, regular walks help build up endurance, stamina and muscle strength, who would take on a marathon with no training? At any break air out the feet, keep them cool and dry. Towel them off too. If you get any debris or dirt into your footwear – STOP! Remove it then and there, this is no place for “it’ll be grand.” Listen to your feet, if they are complaining deal with it at the time, either alter your pace or stop and check them. Blisters occur for about 50% of participants in any walking activities, they are caused by heat from friction of the sock on the foot, add to this the moisture from sweat which stops the sock from gliding on the foot and it’s a recipe for pain. Keep them cool dry and clean and when on an evening break let as much air at them as possible. If you do get a blister, clean it with soap and water, keep it covered with a sterile dressing and if necessary use a pad to take as much pressure away as possible. If the skin is broken you can cut a ring shaped pad, using a small amount of antiseptic/antibiotic cream in the centre to keep infection out as much as possible and cover with a dressing. At night try to let it dry out. Taking the roof off a blister can be very satisfying but it’s a real no-no, leaving a path for infection and an extremely painful hotspot. Hacks are caused by a break in the skin, normally around the heels due to dry hard skin which splits under pressure. These are mighty painful at every step! Use tape which doesn’t stretch, duct tape is good. Clean it well and apply it like a steristrip, put half on one side of the hack, push the 2 sides together with your thumbs and roll the other half across it. Pain gone cos it holds it together. If any wound is deep, bleeding or shows signs of infection i.e. Redness, swelling or warmth, seek Medical Advice. 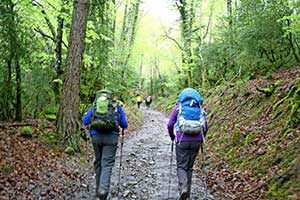 Good luck with your Camino journey and listen to your feet, walk smart! Hi Kit, there are a lot of shoes that could be suitable but it depends on what route you take. 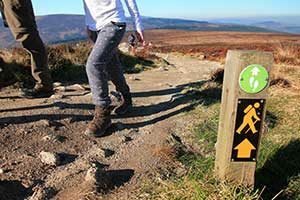 If you are planning on walking sections with more elevation and hills then a good pair of lightweight hiking boots that are well worn in is a good option. You are walking over flatter terrain then a good pair of walking shoes will suffice. Berghaus do a good range of boots. Also, Merino wool socks are key. They help to prevent blisters and keep your feet dry. I hope that this helps. Kindest regards, Lisa.